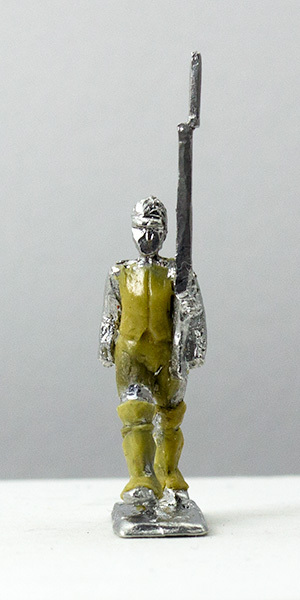 On last year I offered possibility to sculpt and produce your desired Infantry Units. Last ordered set will be released before Christmas and I make available new Christmas Offer 2018. Ordered sets will be released before next Christmas (2019). and Revolutionary French Les Bleus will be available on next week. We may discuss here your wishes for next year.. I second v Winterfeldt's suggestion of Bavarian infantry in Rumford casquet and uniform circa 1799. I will take 6 orders, so after von Winterfeldt bookings there are 4 available sets left. You mailed me before, that you may have new thoughts about sets. What scale for the Bavarians? 6mm, 10mm, 15mm? 1:100 means 15-18 mm. Mostly 16-17 mm. But all equipment is 1:100, as AB figures. I remember, that if you want to gift yourself some desired infantry unit for next Christmas, then this Christmas offer run until the end of January. Last days for this Christmas Offer. May take 3 more orders to produce your desired infantry sets. So the offer ends today. Because majority of this year sets have similar long gaiters, I create special master doll for all of them.